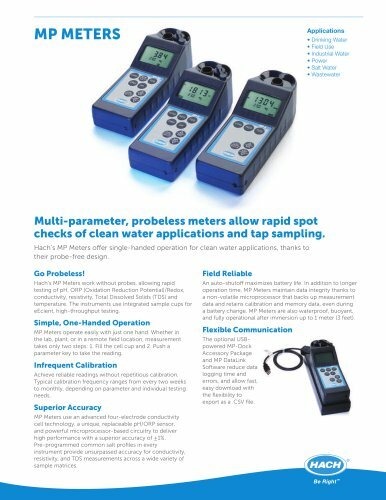 Applications • Drinking Water • Field Use • Industrial Water • Power • Salt Water • Wastewater Multi-parameter, probeless meters allow rapid spot checks of clean water applications and tap sampling. Hach’s MP Meters offer single-handed operation for clean water applications, thanks to their probe-free design. Hach’s MP Meters work without probes, allowing rapid testing of pH, ORP (Oxidation Reduction Potential)/Redox, conductivity, resistivity, Total Dissolved Solids (TDS) and temperature. The instruments use integrated sample cups for eEcient, high-throughput testing. Simple, One-Handed Operation MP Meters operate easily with just one hand. Whether in the lab, plant, or in a remote eld location, measurement takes only two steps: 1. Fill the cell cup and 2. Push a parameter key to take the reading. Infrequent Calibration Achieve reliable readings without repetitious calibration. Typical calibration frequency ranges from every two weeks to monthly, depending on parameter and individual testing needs. Superior Accuracy MP Meters use an advanced four-electrode conductivity cell technology, a unique, replaceable pH/ORP sensor, and powerful microprocessor-based circuitry to deliver high performance with a superior accuracy of ±1%. Pre-programmed common salt proles in every instrument provide unsurpassed accuracy for conductivity, resistivity, and TDS measurements across a wide variety of sample matrices. Field Reliable An auto-shutoff maximizes battery life. In addition to longer operation time, MP Meters maintain data integrity thanks to a non-volatile microprocessor that backs up measurement data and retains calibration and memory data, even during a battery change. MP Meters are also waterproof, buoyant, and fully operational after immersion up to 1 meter (3 feet). Flexible Communication The optional USBpowered MP-Dock Accessory Package and MP DataLink Software reduce data logging time and errors, and allow fast, easy download with the exibility to export as a .CSV le.